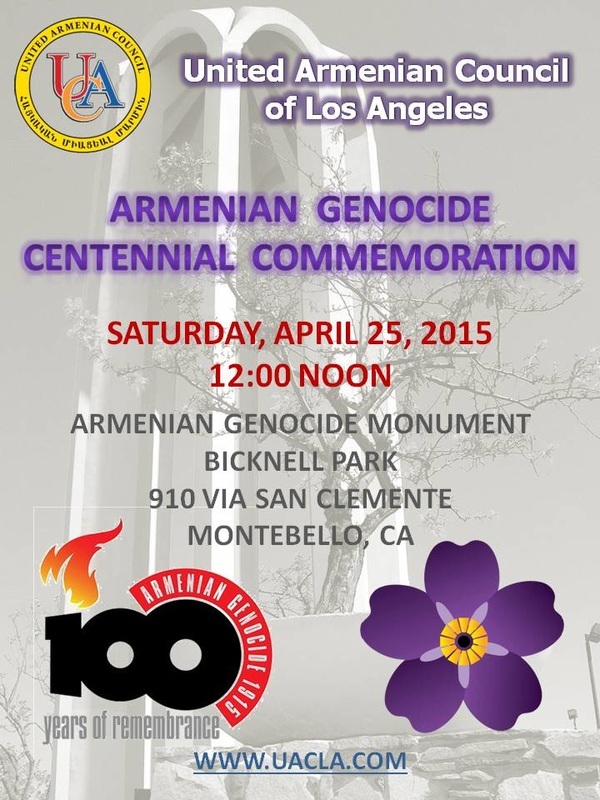 In this the centennial year of the Armenian Genocide, plans are in place for the Armenian community of Southern California to gather on April 25, 2015, at 12:00 noon, at the Montebello Armenian Genocide Martyrs Monument to remember and demand justice for the 1,500,000 victims of the Armenian Genocide. Traditionally, the memorial event in Montebello has taken place on April 24th, the day Armenians world-wide officially commemorate the horrific tragedy. However, the event is taking place on April 25th, this year, because the main and largest community event dedicated to the remembrance of the Armenian Genocide, the March for Justice, will be held on April 24th from the Little Armenia section of Hollywood to the Turkish Consulate. As the community has done every year since the Monument’s consecration in 1968, this year’s ceremony at the Montebello Armenian Genocide Martyrs Monument will feature a full program which includes political messages and a religious service officiated by all religious denominations of the Armenian community and cultural presentations to honor the memory of those lost. The United Armenian Council of Los Angeles (UACLA) which is comprised of more than 60 Armenian religious, political, compatriotic, and other active community associations is the organizer of the commemorative event. The UACLA also organized and/or sponsored several other events as part of its centennial year remembrance agenda, including art exhibits, blood drive, educational resource packages and several other events. More details about these activities will be presented to the general public through subsequent press releases of the UACLA and at the UACLA website www.uacla.com. The UACLA is also active throughout the year by organizing educational events and seminars and by sponsoring distinguished scholars in the field of the Armenian Genocide. The Montebello Armenian Genocide Martyrs Monument is located at Bicknell Park, 901 Via San Clemente, Montebello, Ca, 90640. The UACLA invites all community members to attend the commemorative event at the Montebello Armenian Genocide Martyrs Monument on April 25th. The United Council also calls upon everyone to take part in great numbers in all 100th anniversary commemorative events, especially the March for Justice, to be held on April 24th in Los Angeles.